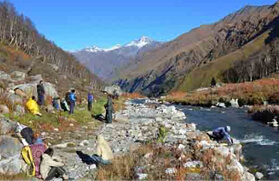 Counted among the renowned treks in the Garhwal Himalayas, the Har ki dun trek is best for trekkers who are trekking for the first time. 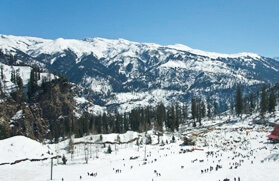 Har Ki Dun valley is located at a height of 3566 mts at the base of Fateh Parvat. 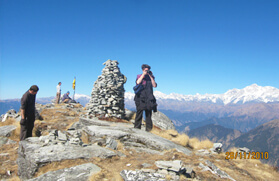 It is an easy to moderate trek. Surrounded by dense forest and sparkling mountain peaks, this place is paradise for nature lovers. As the name states, Hari means God and Dun means Valley, Har Ki Dun also known as the Valley of God is a holy place. As per mentioned in Hindu scriptures (Granth), Pandavs went to heaven through this mountain. Duryodhan is worshipped as a God here by a few communities. One can find the temple of Duryodhan located in this valley. 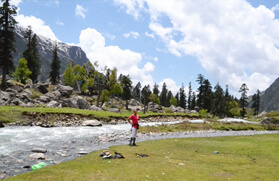 This place works as a base to reach to Swargarohini peak and Jaundar Glacier as they are situated in the southeast of Har-ki-dun. Bandar Punch Mountain is located in the west of Har-ki-dun. Farming of Rajma, Potatoes and Rice is the major source of survival of the locals in this area. 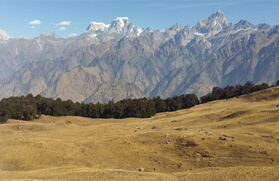 This valley is also connected to Baspa Valley. 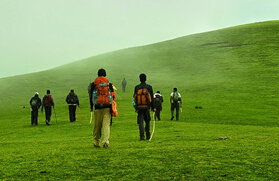 This trek begins from Delhi - Dehradun - Sankri - Taluka - Osla - Har Ki Dun. 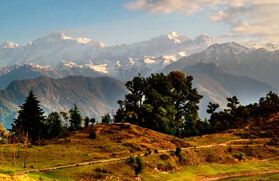 You will be crossing through many dense forests of walnut, chestnut, chinar and willow trees. The trail from Osla to Har-ki-dun will take you through terraced mountain meadows, thick forests and lush grassy patches. This place is acknowledged for intricately fixed houses made of stones and wooden beams. These houses are earthquake and energy resistant. If you are interested in listening to the stories of history, then wonderfully engraved temple dedicated to Duryodhana - the Kaurava Prince is something must watch for you. 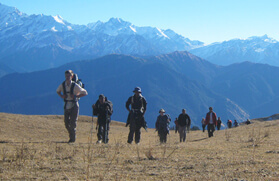 At Trekking in India, we offer you an amazing Har Ki Dun Trekking Tour to make your holidays more enjoyable. Har-Ki-Doon, also known as the hanging valley of gods is the right place to find out how nature has blessed this valley of gods with so much beauty. Morning after breakfast trek to Har Ki Dun. Initially the trek goes past some fields of beans & rice and also some isolated villages, where the life style is same as old, and the untouched one. The dress worn by the people is traditional. Their cheerfulness and innocence combined with their simple way of life make them very appealing. A common scene in the evenings is that of ruddy cheeked village belles returning home, carrying on their backs huge loads of pine needles & cones to be used as fuel. The trail steadily ascends the side of the ridge across the river and then veers left to the Har Ki Dun valley. Dense forests at this part give way to the meadows that are scattered with flowers and flowering herbs. Dinner and Overnight stay in tents. 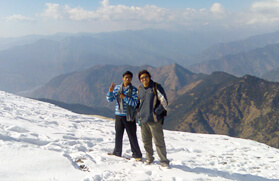 Today we will trek 14 kms to reach Debshu Bughyal. It will take 4-5 hrs at leisure pace as the trail is generally downhill. Overnight in tents. Today we start trekking early towards Ruinsara Tal. 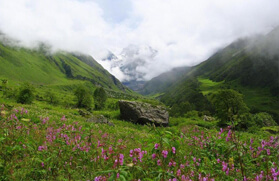 The Trek from Debsu Bughyal to Ruinsara Tal is through, terraced mountain fields, lush green grassy lands and conifer forests through extremely scenic landscape. 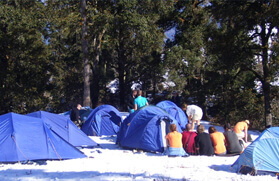 The gradient of the trek is moderate and one will be able to complete the trek in 5 - 6 hrs on arrival at the lake set campsite. Overnight in tents. The day is for rest / acclamatisation / exploration. 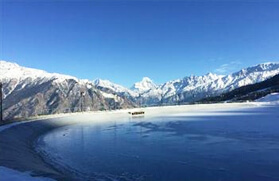 One can explore the surroundings around the lake. The place is full of photographers delight. Dinner and overnight stay in tents.